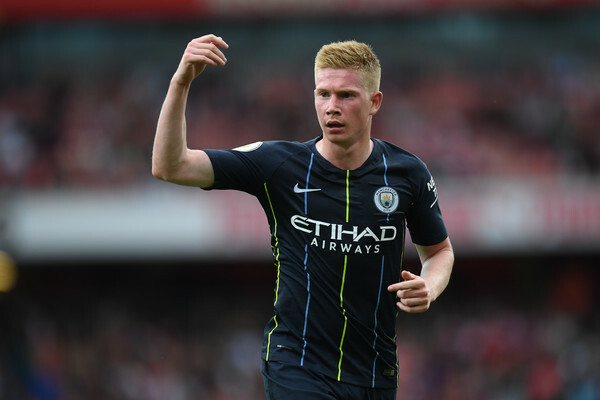 Home > Kevin De Bruyne > manchester city > Premier League > De Bruyne: "We don't have to win the Champions League to be a success"
De Bruyne: "We don't have to win the Champions League to be a success"
Manchester City kicked off their Premier League title defense with a resounding 2-0 victory away at Arsenal last Sunday. Belgium attacking midfielder Kevin De Bruyne came on as a second-half substitute in the match as he returned late to preseason due to the World Cup. The former Chelsea player spoke to the BBC about their expectations this year and also the upcoming Man City Amazon prime documentary "All or Nothing" due to be released on Friday, 17th of August. City set new records in the 2017/18 Premier League season, scoring 106 goals and winning 32 matches to reach 100 points. "Last year was almost perfect," said De Bruyne, 27, who joined City in 2015. "If we are going to be champions on the last day, the last kick of the season, then I am also going to be happy." The Manchester side have won three Premier League titles since the Abu Dhabi United Group took over, but have failed to win the European title. City's best performance was reaching the semi-final in the 2015/16 where they were knocked out by eventual champions Real Madrid. Pep Guardiola took over during that summer and he has also struggled to take his team beyond the quarterfinals despite their incredible run in the League last season, they were knocked out in the quarter-final by Jurgen Klopp's Liverpool in one of the most exciting English clash in Europe. Some Critics, Pundits, and some football fans are of the opinion that the top European clubs have to win the UEFA Champions League to be considered "great", a view Kevin De Bruyne is against. "I don't agree that we have to win the Champions League to be a success. It is a big title to win but in the Champions League, you don't need to have the consistency that you need in the league. "We were great for the whole year, maybe a bit less against Liverpool, and so we were out. It is a tournament, you need to be good at the right time. "In the league, if you have a bad spell then you are running behind. It is a different prospect, cup games are different to a league." The 27-year old also spoke about Manchester city's top 6 rivals in the Premier League this season saying Liverpool spent a lot but wisely. "The main focus is on us. The other teams are always going to push us, Liverpool did what we did last year. They have spent a lot of money but wisely. "They needed some additions and they have got them in the right places. They saw that they had to up the level to come closer to us and we are trying to maintain what we have done last year. It will be a good battle between the top sides. "The top six is always challenging. I don't make a difference between any team. Liverpool spent the most this year, but last year it was us and Manchester United. Now there are other teams in the Premier League who spend more than us, they have to do what they have to do to be better."